Explanation: A jewel of the southern sky, the Great Carina Nebula, also known as NGC 3372, spans over 300 light-years, one of our galaxy's largest star forming regions. Like the smaller, more northerly Great Orion Nebula, the Carina Nebula is easily visible to the unaided eye, though at a distance of 7,500 light-years it is some 5 times farther away. This gorgeous telescopic close-up reveals remarkable details of the region's central glowing filaments of interstellar gas and obscuring cosmic dust clouds. The field of view is over 50 light-years across. The Carina Nebula is home to young, extremely massive stars, including the stars of open cluster Trumpler 14 (below and right of centre) and the still enigmatic variable Eta Carinae, a star with well over 100 times the mass of the Sun. Eta Carinae is the brightest star, seen here just above the dusty Keyhole Nebula (NGC 3324). 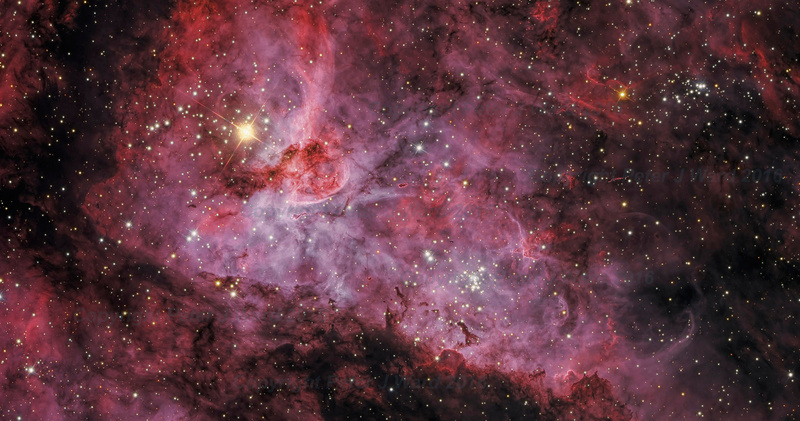 While Eta Carinae itself maybe on the verge of a supernova explosion, X-ray images indicate that the Great Carina Nebula has been a veritable supernova factory.